Mountain Biking Durango Colorado, Iron Horse Bicycle Classic, Durango World Cup, Cross Country, Downhill Durango, Specialized, Durango Cannondale, Mountain Bike Racing in Durango, Gary Fisher, Rock Hoppers & stump Jumpers. 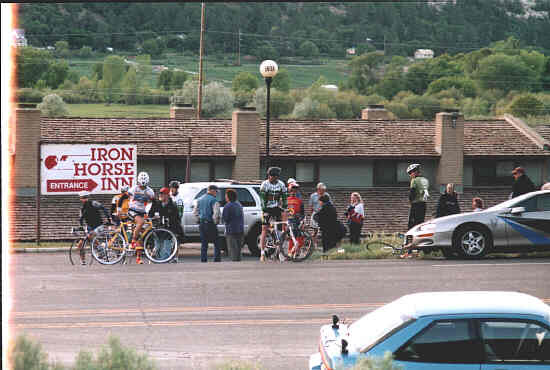 Bike Season is just starting to get rolling for 2003, 2001 brought us the Durango World Cup and 2002 saw The Norba Nationals we will have race results and photos of the start of this years race, and pictures of the race against the Durango Silverton Narrow Gauge Railroad. What Started as a bet between two brothers, one that thought that, a man on a bicycle could beat the train to Silverton, Colorado, now has evolved into an annual race, that peat's the train against the human locomotive, Sooo, who wins, well!! the bicycle riders make it over in a little over 2 hours, the train, well it takes 4 hours?